This galaxy, known as NGC 2337, resides 25 million light-years away in the constellation of Lynx. NGC 2337 is an irregular galaxy, meaning that it—along with a quarter of all galaxies in the universe—lacks a distinct, regular appearance. The galaxy was discovered in 1877 by the French astronomer Édouard Stephan who, in the same year, discovered the galactic group Stephan's Quintet (heic0910i). Although irregular galaxies may never win a beauty prize when competing with their more symmetrical spiral and elliptical peers, astronomers consider them to be very important. 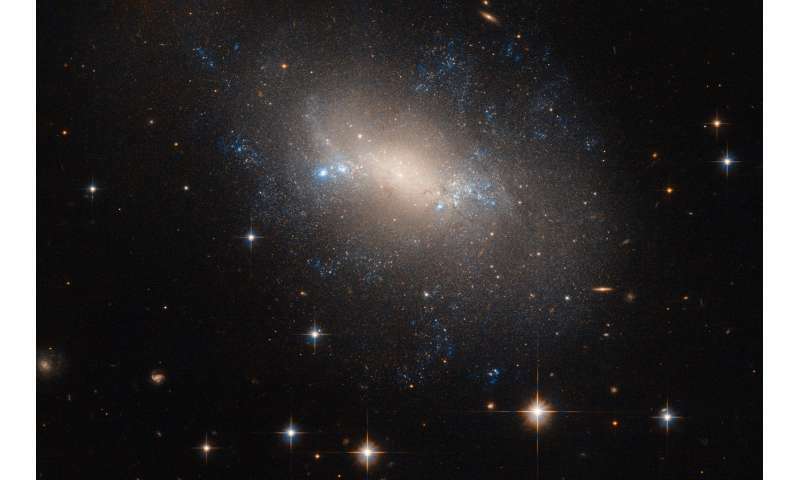 Some irregular galaxies may have once fallen into one of the regular classes of the Hubble sequence, but were warped and deformed by a passing cosmic companion. As such, irregular galaxies provide astronomers with a valuable opportunity to learn more about galactic evolution and interaction. Despite the disruption, gravitational interactions between galaxies can kick-start star formation activity within the affected galaxies, which may explain the pockets of blue light scattered throughout NGC 2337. These patches and knots of blue signal the presence of young, newly formed, hot stars.